Slow and steady may win the race, but the glow of this critter will light up the place. Perfect for end tables, night stands or kids' rooms, this vibrantly colored accent lamp features a tortoise shell-shaped shade made of Tiffany-style glass. His friendly face and cute little feet peek out from underneath. 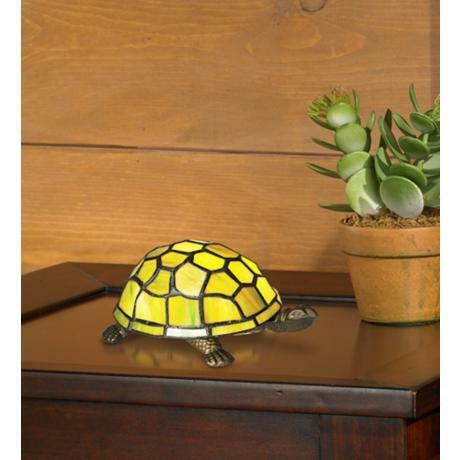 Whereever you set this adorable tortoise lamp, ot will surely warm and brighten someone's heart. - Bronze finished resin base. - Includes one 20 watt G9 bulb. - 5 1/2" wide x 4" high x 8 1/4" deep.